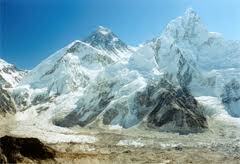 The Everest or Kathmandu region is justifiably the most famous of all trekking and Mountain regions. The Mt. Everest is located in Eastern Nepal, the Everest Region offers a wide range of trekking experiences.From the Everest base camp trek (listed as one of the best trips in the world) to treks in remote semiwilderness areas, there is much to choose from. 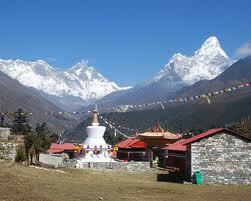 Khumbu is also the home of the Legendarys sherpa . 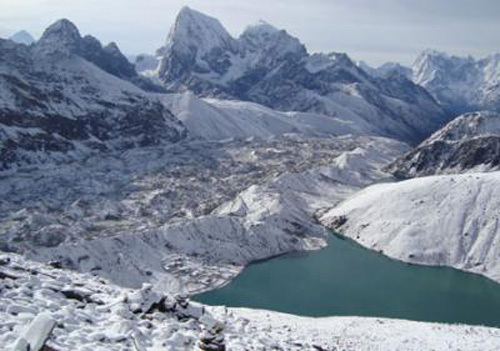 The Northern part of this Region lies within the Sagarmatha National park. Which was established to protected the fragile echo-system of the alpine region.to the east of the Sagarmatha National is the Makalu-Barun National park, a remote and wild stretch of Mountain peaks and deep, densely forested valleys. To the west is the Rollwalling valley, a well protected microcosm of cultures. The southern part is less frequented by tourists but could be a very rewarding destination in its own right.Mt. Everest naturally is the maor attraction here, but in the Everest region other 8,000 meter peaks in the region such as Lhotse and Cho-you besides the many lesser peaks which are no less stunning. 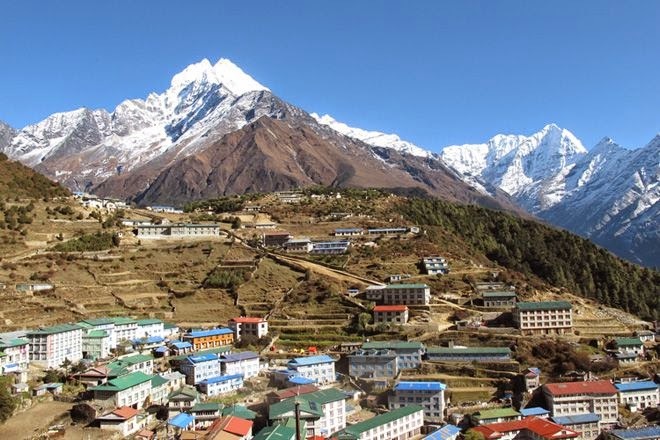 There’s more to Khumbu than just mountains Everest region trek trail walk through the local village way to the Everest base camp on the route. The Sherpa peoples warm welcome you in every village. The Everest area landscape terrain with deep gorges, glaciers and huge rocks. The vegetation in the Everest National park change from pine, Hemlock, Fir, Juniper, Birch, Rhododendron,Dendrobium,lichens and Shrubs to alpine plants and than to bare rock and snow. It is home to the Ghoral, Thar, Serow, Musk deer,Snow leopard,Himalayan black bear,Red panda,Yellow Throated marten and Yak as well as the charming villages and Ancient Buddhist, Monasteries, in March and April the Rhododendrons blooms and splash colours in magical Mountains and all up to make this Everest region an irresistible tourist destinations. Day 1: Arrive Kathmandu in the early evening and transfer to the Royal Singi Hotel. Day 2: We fly to the mountain airstrip of Lukla (2,800m), and set off on the first short leg of our trek, heading northwards up the valley of the Dudh Kosi (or 'milk river'). We descend from the small plateau, down into the forested valley. The trail offers some tantalising views before reaching the small settlement of Phakding (2,652m), where we spend our first night. Day 3:Heading out of Phakding we follow the Dudh Kosi northwards. This day's walk takes us through magnificent forests of rhododendron, giant fir and magnolia trees, and both in spring and autumn the ground is bright with flowers. After Jorsale (2,805m) we cross the west fork of the river, the Bhote Kosi, and start the steep climb to Namche Bazaar. About 300m up this ascent we should have our first glimpse, cloud-permitting, of the summit of Everest appearing majestically behind the great ridge of Nuptse-Lhotse. Another 300m of climbing brings us to Namche Bazaar, administrative centre of the Khumbu region. Namche is a prosperous Sherpa village and an important trading centre with a weekly market selling fresh foodstuffs brought up from lower villages. Day 4:We climb steeply out of Namche to the Everest View Hotel. Built by the Japanese this spectacularly situated hotel with wonderful views of Everest and Ama Dablam is an ideal place for a tea break. 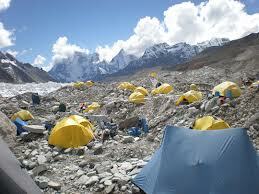 Continuing, we trek to the villages of Kunde and Khumjung set below Khumbila, the rocky peak sacred to all Sherpas. In Kunde we can visit the Edmund Hillary hospital,and there should also be time to visit the monastery in Khumjumg, where for a small donation we will be shown the only Yeti skull in the world! Descending to the main trail we spend the night at Kyanjuma. Day 6 -7:We descend through the forest to Devoche and a little further on we cross the rushing Imja Khola, whose valley we now follow. Climbing steadily the trail enters Pangboche, at 3,900m, the highest permanent settlement in this valley. Ascending the valley we have lunch at Shomore, after which we leave the trees behind and cross a wooden bridge at the confluence of the Khumbu and Imja Kholas, A short steep climb brings us to Dingboche, at 4,530m, a summer settlement where great peaks surround us. We spend a day at Dingboche to continue our acclimatisation. Those adapting well to the altitude can climb Nangkartshang Peak at 5,100m for great views of Makalu, Lhotse, Chalotse, Tawoche and Ama Dablam. 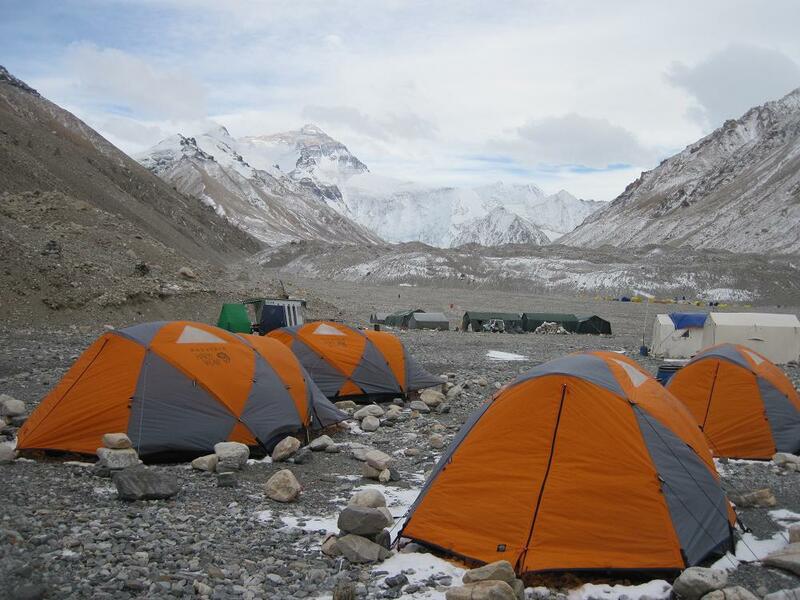 Day 9:A very long, hard day today as we leave very early, following the Khumbu Glacier northwards to Gorak Shep (5,180m). After a rest and something to eat we trek across the sandy flat at Gorak Shep and climb onto the lateral moraine of the Khumbu glacier. The trail ascends the side of the glacier for a couple of hours before finally descending onto the rocky glacial moraine itself. The trail winds up and down through fascinating ice seracs to the area known as Everest Base Camp, where in spring, we might see some of the expedition teams as they prepare to climb the mountain. From the Base Camp we get fantastic close up views of the Khumbu Ice Fall and we can appreciate just how difficult it is to negotiate a route through the huge blocks of ice. Nuptse towers above us and Pumori rears up behind us. After a short photo stop we retrace our steps to Gorak Shep. Day 10:Another hard day as we climb steeply above Gorak Shep to the small peak of Kala Pattar, 'Black Rock', at 5,545m from where we can look down over the base camps of the various Everest expeditions. This climb affords a magnificent view of the Khumbu Glacier and above all a close-up view of the world's highest mountain. We return to Gorak Shep and retrace our steps to Lobuje for lunch and then continue on down the valley to the lower altitude of Pheriche for the night. 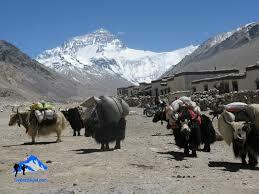 (Please note that the walk to Everest Base Camp and the climb of Kala Pattar are both very tough. Sometimes we may change the order in which we tackle the walks depending on the group's ability and weather conditions). Day 11 - 13:Descending through Pheriche, we cross a small bridge and have a short climb before descending to join the main Imja Khola Valley. We follow the valley down to Pangboche through an alpine meadow landscape. We drop down to the rushing river then walk through the peaceful rhododendron forests to the village of Devoche from where we climb back up to Thyangboche on the ridge. We descend off the ridge to Phunki Tenga and walk back to Kyanjuma, where we spend one night. The walk to Namche Bazaar takes us along a beautiful undulating trail high above the Dudh Kosi. Descending through Namche Bazaar, we pick up our outward trail again to Phakding, where we stay for a night. 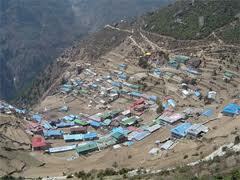 At Chaunrikhara we leave the main trail and climb the short distance to the airstrip at Lukla. Day 16:End Kathmandu after breakfast.